**BEST PRICES IN THE COUNTRY! ** Normally $280/case, Now $204.99/case! 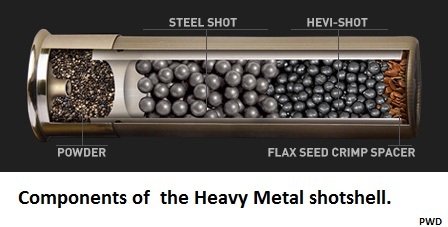 HEVI-Metal shells offer 20% more pellets on target than any super steel on the market. A blend of steel pellets layered with HEVI-Shot pellets (two shot sizes smaller to match the ballistics of the steel pellet) greatly increase your odds of filling your limit. Hevi-Shot is heavier than lead! We have comprised a density/weight comparison chart of the various shot choices on the market below for your information. When it comes to shear knockdown power at a distance, it's hard to beat Hevi-Shot. "Hevi-Metal - I didn't come this far to miss!" **SALE** Normally $280/case, Now $204.95/case! PLUS FREE SHIPPING! **SALE** Normally $280/case, Now $204.95/case! FREE SHIPPING! **SALE** Normally $280/case, Now $199.99/case! PLUS FREE SHIPPING! **SPRING SALE** Normally $280/case, Now $204.95/case! PLUS FREE SHIPPING! **SALE+FREE SHIPPING** Normally $280/case, Now $204.95/case! PLUS FREE SHIPPING! **FALL SALE** Normally $280/case, Now $204.95/case! PLUS FREE SHIPPING!